There's No Controversy: Let's Stop Failing Our Children On Evolution : 13.7: Cosmos And Culture As young-Earth creationism and its "humans and dinosaurs co-existed" discourse continues to be popular, anthropologist Barbara J. King takes a look at how to help kids understand evolution. Visitors pass outside the front of a replica Noah's Ark at the Ark Encounter theme park in Williamstown, Ky., in early July. Watching the NBC Nightly News broadcast on a Friday earlier this month, I gaped as the last segment aired. Kevin Tibbles was reporting from the site of Kentucky's Ark Encounter, constructed by Christian fundamentalist, young-Earth creationist and Answers in Genesis president Ken Ham. At the time, Ark Encounter was set to open to the public the following week. Tibbles described Ark Encounter as telling "the Old Testament story of Noah, the animals and, of course, the flood." He interviewed Ham and closed out the 2-minute piece by noting Ham's hope that people will come in droves "to study the story of Noah for generations to come." What did Tibbles fail to explain? For one thing, that the Ark shows in its animatronic displays the co-existence of dinosaurs and people. Dinosaurs, of course, went extinct (well, except for birds, but that's another subject) 65 million years ago; the human lineage evolved 6 million years ago, and our own species about 200,000 years ago. "There wasn't a single voice of opposition. There wasn't any mention of how the state government is giving Answers in Genesis up to $18 million in tax breaks. And there wasn't even a mention of how the whole Noah's Ark story is fiction." The NBC segment was a prime example of a missed opportunity in mass-media science literacy education — education that's sorely needed. Ark Encounter isn't the only summer-vacation creationist destination out there. 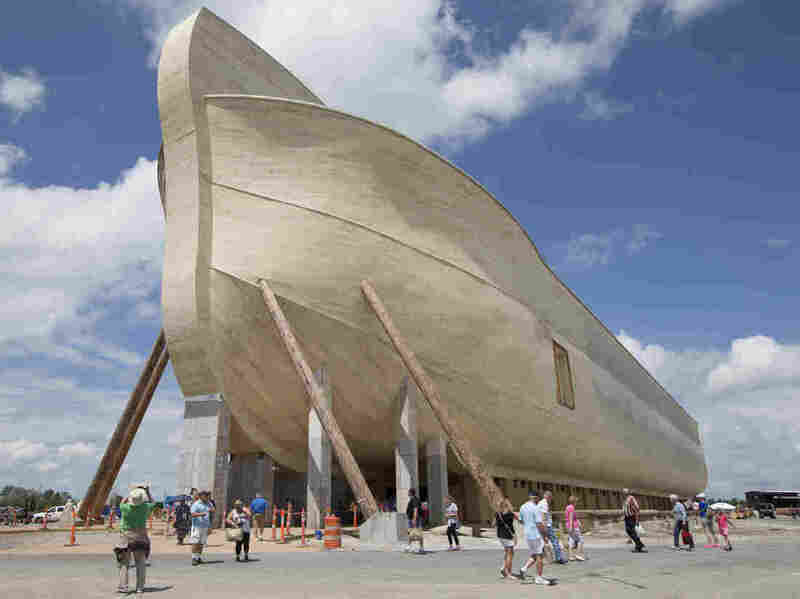 The next stop after Ark Encounter could be the Grand Canyon for a creationist rafting trip down the Colorado River, during which rafters are informed that the Grand Canyon was formed in a great flood sometime after God's creation of the Earth itself 6,000 years ago. Science, of course, tells us that the Grand Canyon dates back many millions of years. As Ann Reid, director of the National Center for Science Education (NCSE) puts it, the Grand Canyon "is one of the most powerful places on the Earth to show the difference between religious thinking and scientific thinking." That's exactly why the NCSE does its own science-based Colorado rafting trips. And that's exactly what we could use more of this summer, and always: explicit pushback to anti-science creationist discourse. We all know that the statistics in the U.S. on understanding and acceptance of evolution are discouraging, but what worries me most is when creationism masquerading as science is just accepted with a shrug, as if, "hey, it's just part of American society now." In this way, we all fail our children. *Speak out and speak up to school boards. Parents can insist that biology teachers in public schools be well-qualified to teach evolution; currently, many are not. In a related vein, check in with the "Take Action" page of the NCSE. *Let the media know when they do a poor job of covering evolution-related issues or, conversely, a good one. The week after the NBC Nightly News segment, CBS News aired a report from Ark Encounter. Correspondent Mark Strassmann talked to Ham — and to a visitor who confirmed her belief that dinosaurs and people "walked hand-in-hand" a few thousand years ago on Earth. But he went on also to interview Jim Helton from Tri-State Freethinkers and science communicator Bill Nye "The Science Guy" as well, who stood up for evolutionary science. *Read science- and evolution-based books to, and with, your children. Even young kids may enjoy and learn from age-appropriate writing that gets across concepts of evolution. Last year, I wrote here about Grandmother Fish by Jonathan Tweet and illustrator Karen Lewis. Another example is Evolutionary Tales by Matt Cubberly and illustrator May Villani, a short book that invites children to think about adaptive features of animals like the sugar glider, tarsier and pileated woodpecker. The Washington Post does report that Trump's running mate, vice presidential nominee Mike Pence, judging from a 2009 television interview, favors teaching "all the facts" about the "controversial areas" surrounding evolution. This "teach the controversy" strategy matches the one adopted by young-Earth creationists and intelligent-design advocates. Science-minded people know there is no controversy. Creationism is religion. Our children must be taught about evolutionary science in order to become fully science-literate.